This first installment of the Everyman Unchained-series clocks in at 19 pages, 1 page front cover, 1 page editorial, 1 page SRD, leaving us with 16 pages of content, so let’s take a look! The Pathfinder Unchained book has taken some time to find traction among my players, but it’s slowly getting there – the modifications of the base classes make sense to me in quite a few ways. That being said, while I am not a fan of all changes and design-decisions utilized in the respective revamps of the base-classes, there is undoubtedly one fact that may prove to be somewhat unpleasant for some groups – quite a few of the extensive customization options in pathfinder, namely archetypes, no longer work as intended with the Unchained iterations of the classes. 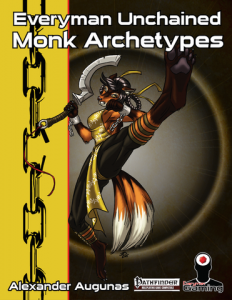 Enter this book and its modifications of archetypes to work with the unchained monk, perhaps the class that has seen the most significant changes – to the point where a designer imho needs to recalibrate and re-assess balance of tie-in options. Now interesting, not only for other designers, but also for GMs seeking to use obscure archetype xyz with the unchained monk would be the first page’s “cracking the code”-sidebar – in it, suggestions are provided that allow the usage of unchained monks with archetypes – replacement of high jump, for example, replaces the 6th level ki-power instead. This list alone, depending on your ability to extrapolate rules-decisions from ability-dispersal, may be actually worth checking this inexpensive pdf out. While, in my opinion, not enough to maintain a perfect equilibrium, it is a great way to begin looking at the given array of material of an archetype. So what archetypes are covered? The first would be the drunken master, whose Drunken Ki-ability was moved further down to 4th level from 3rd. Alas, drunken strength, which still is located at 5th level, still retains an odd choice inherited from the base ability: “At 5th level, a drunken master can spend 1 point of ki as a swift action…” is how the damage-increase is introduced, right? Right. However, the follow-up benefits of the ability always specifically refers to drunken ki, which, as a resource, is at once more and less limited than base ki: Unlike regular ki, drunken ki allows for the replenishment of drunken ki via alcohol at the expense of actions – the basic archetypes issue in juggling these two terminologies has unfortunately been inherited here, with the basic drunken ki-requirement to initiate the abilities still being here. On an interesting side-note, drunken resilience replaces the 14th level ki-power, but becomes available at 13th level in the unchained iteration. personally, I do enjoy the fact that Firewater Breath was moved down to 18th level, though I still wished it was gained earlier and scaled. The Flowing Monk’s bonus feats remain unchanged from the base archetype and the signature redirection ability is also retained as substitute for Stunning Fist. Unbalancing Counter and Flowing Dodge also are still at 2nd and 3rd level, respectively. Elusive Target’s upgrade has been moved down one level to 12th. Volley Spell, moved down one level to 16th, does sport a missing italicization and, much like the basic archetype, does sport an ambiguity in the wording – the ki-powered spell turning-effect hinges on whether the monk can pay the cost, but how does he know it? I assume a Spellcraft-check as being available as part of the ability, but I still wished this minor issue of the base archetype had been cleaned up. The Gray Disciple duergar-archetype’s fade from sight remains at 4th level and replaces still mind and the 4th level’s ki-power, gray heart replacing the 6th level ki-power and bonus feat etc. – essentially, the replacements follow the guidelines established in the beginning, though born in darkness is moved up to 8th level. Earth Glide remains at 12th level and both entomb and earthen thrall are moved down a level to 16th and 18th level, respectively, also replacing those abilities. The Hungry Ghost Monk is not one of my favorites – and, alas, this did not change here. The use of Punishing Kick at 1st level is retained, but the Steal Ki ability, which fails the kitten-test in the base archetype, still is here – essentially, the archetype allows for the abuse of puny creatures to de-limit an otherwise limited resource. I would have, especially considering the increased array of options for ki-use, to see that ability be studded with a proper cap. The same holds true for life funnel and the follow-up abilities, though these are moved to be gained one level later than in the base archetype – this one represents a missed opportunity to fix the blunders of the original. The Hobgoblin Ironskin Monk moves ki pool down to 3rd level, while retaining the lower-level base abilities and bonus feat-list modifications and staggering blow is moved down to 4th level as well, replacing the ki-power gained there. Conversely, Tough as Nails’s benefits now only cost the 6th level ki power, which is fine by me. A significant power-upgrade would be surefooted’s move – down 4 full levels! Now, only 13th level Ironskin monks can ignore ALL kinds of difficult terrain – I’m not 100% sold on moving this powerful high-level ability down to the higher echelons of mid levels. Kata Masters gain panache at first level and Ki pool at 3rd level – which has been exchanged with menacing swordplay, which now is gained at 4th level and the follow-up abilities, obviously, are moved to 8th and 16th level, respectively. I’m not a big fan of this one – with Cha and Wis, the kata-master is more MAD than the default monk, while at the same time allowing for the escalation of panache-points via ki -the conversion to unchained monk is solid, though. The Karmic Monk retains, obviously, the signature ability of the base archetype, with balanced mind being moved to 4th level and ki-pool’s modification also being kept as is. Harmony also remains in place, with karmic disruption now replacing the 16th level ki power. Harmonic self remains unchanged as a capstone. The Ki Mystic has the ki-pool moved to 4th level and Mystic Insight retains functional at 5th level. Mystic Visions are moved to 12th level, where they replace a ki-power and mystic prescience now being found at 14th level, but to balance this, mystic persistence is gained one level earlier, at 18th. The Maneuver Master monk receives an interesting modification – the flurry of maneuvers no longer entails penalties on subsequent maneuvers to CMB, allowing you to properly combo them. Seeing the unchained monk’s full BAB, this actually makes the archetype a relatively sound choice for the character seeking to play a lot with maneuvers. Reliable maneuvers now eats the 4th level ki-power, while sweeping maneuver and whirlwind maneuver are gained one level later. The Martial Artist’s design is DIFFERENT in the ability-dispersal: Exploit Weakness can be found at 3rd level, a means to use Wis-modified level-checks or Sense Motive to analyze foes and better defeat them. 4th level allows for monk level to qualify as fighter level for feats when applying them to unarmed strikes and monk weapons and also nets Pain Points. Extreme Endurance remains pretty much the same, with physical resistance being tied to ki-power-replacement. 8th level’s ki power is replaced with a bonus feat, defensive roll is gained at 12th level, while the higher level abilities of the archetype are gained one level later than usual. I’m not sure I’m wholly sold on this one -sure, the improved BAB of the unchained monk makes the archetype more feasible, but I really believe this could have used some new tricks to offset the falling away of all the nifty ki-tricks. Then, that may just be me. Odd: The archetype still has ki strike, which it can’t use. Masters of Many Styles faced an intriguing challenge and received an ability that allows them to utilize multiple style strikes whenever executing a full attack, with the general design here being pretty awesome – kudos! Monks of the Empty Hand move the ki-pool modification down to 3rd level, obviously -it also seems to have a rather nasty glitch: Ki Weapons, as provided here, replaces the “5th and 11th level ki powers” – which do not exist – are we speaking of the style strikes here or are the levels not correct? Monks of the 4 Winds, unlike in Purple Duck Games’ version, replace the 12th level ki power with slow time, while aspect master and the capstone retain their level-positions. Solid version. Monks of the Healing Hand move their gained abilities down one level, replacing the respective ki-powers, with ki sacrifice also eating the 16th level ki power. Okay, though here, I prefer Carl Cramér’s more modular take as ki powers. The Monk of the Lotus retains, obviously, Touch of Serenity, with touch of surrender eating the 12th-level ki-power, while Learned Master has been moved down to 13th level -where it imho fits better. Touch of Peace, once again, is moved to 16th level to replace the ki-power gained there. Monks of the Sacred Mountain pay for Iron Monk with evasion and for adamantine monk with improved evasion, which are pretty bad deals in my book. Bastion Stance and Iron Limb Defense are paid for via ki-powers at 4th and 6th level, with Vow of Silence being available at 13th level in lieu of tongue of sun and moon – nice. Still, not a perfect choice. The Nimble Guardian Catfolk monks retain defensive aid at 2nd level and move nimble reflexes to 4th level in accordance with the still mind ability they replace. Defensive Mastery can conversely still be found at 5th level, while evasion is gained at 9th instead of its improved brethren, while guardian feline was moved to 8th level to replace the ki power found there. The Sohei retains Devoted Guardian, the stunted unarmed strike progression, etc. and monastic mount also remains. Ki Weapon eats the 4th and 8th ki-power and weapon training eliminating the 6th, 12th and 18th level ki powers – odd: Why retain the 10th and 14th and 16th level ki power, when the earlier ones are all replaced? The unchained Oread Student of the Stone, in Alexander Augunas’ interpretation, retains the basic abilities of the archetype, while bones of stoen replaces the 6th level ki-power. Body of Stone’s benefits are maintained, while Soul of Stone replaces the 12th level ki power. The unchained Tetori would be an archteype I’d handle with a certain respect – and indeed, this is one example, where Alexander could flex his design-muscles: With Full BAB in the unchained monk’s chassis, graceful grappler has been rewired to retain Dex-bonuses while pinning or grappling and higher levels netting the monster quality grab via Ki, with style strike at 5th level being replaced for better grappling prowess. The basic archetypes tricks with counter-grapples and breaking free are retained at the expense of ki-powers, though obviously, Break Free was moved to 6th level and Form Lock is moved to a level later, while Iron Body obviously comes a level sooner to replace the ki power gained there. 15th level also provides the option to combine stunning fist tricks with grapples and yes, via significant ki-expenditure, even quivering palm. I love this take on the archetype – it fits the unchained monk infinitely better than the base archetype ever fit the old monk – kudos for going the extra mile here! The Vanara Treetop monk remains mostly unchanged, with only freedom of movement now being codified via ki-power-replacement. Solid, I guess. The Halfling Underfoot Adept gets a pretty straightforward conversion, with improved underfoot grace replacing the 6th level ki-power and being moved to said level. The Human Wanderer also follows this paradigm, with Long Walk being moved to 4th level and Light Step being moved to 6th level – though the latter, in an uncommon design-decision, replaces the 4th-level ki-power. Why is this no glitch? Simple – Inscrutable replaces this one. Wanderer’s Wisdom and Fee Step move to one level later to replace the respective ki-powers, while Disappear Unnoticed remains at 12th level and keeps that spot, exchanged for the ki-power gained there. The Wildcat pays for brawler maneuver training (gained at 3rd level) with 8th, 12th and 16th level ki-powers and the ki-pool, with Improvised Weapon Mastery eating the 4th-level ki-power and Knockout eliminating the 6th, 12th and 18th level ki-power, while Turn the Tables eliminates the 14th level ki-power – i.e. yet another ki-less archetype here. Ready for anything is moved to 4th level. On a nitpicky side, if you do not count ki strike as a part of ki pool, the archetype retains this one, which would then be useless – it’s a nitpick, obviously, but one that pales by imho smart dispersal of abilities – the general spread and minor tweaks look and feel solid. Nice! So, the Zen-Archer’s the final one…for this pdf. *sigh* Perfect Strike is retained with the 10th level triple-roll and way of the bow replacing evasion. Ki Pool and the increased range now are available at 3rd level in compliance with earlier access to ki. The interesting component here, obviously, being how the style strike dilemma is resolved, when the Zen Archer notoriously does not need even more damage. The solution is the new maneuver shot, which allows zen archers to designate ranged attacks as maneuvers to a limited extent, thus adding a broadening of options without going the route of numerical escalation – kudos! Ki-focus bow has been moved down to 13th level, which is not as bad as it sounds, seeing the options available. All in all, a take on the Zen Archer that is more conservative than Carl Cramér’s – both of which have pros and cons, both of which work better than I anticipated with unique options presented. Editing and formatting are very good – I noticed not many significant glitches, as I’ve come to expect from Everyman Gaming. Layout adheres to a beautiful two-column full-color standard and the pdf comes fully bookmarked for your convenience and actually features gorgeous (of course, kitsune-themed) artworks by Jacob Blackmon – nice in a pdf of this size! You can get these nice conversions of monk archetypes here on OBS and here on d20pfsrd.com’s shop!